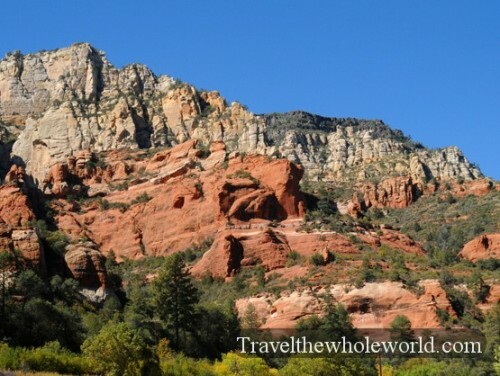 I think Arizona is one of the most unique states, and best destinations in the United States. Most people might be surprised to hear this, but when you think about everything the state has to offer it makes sense. 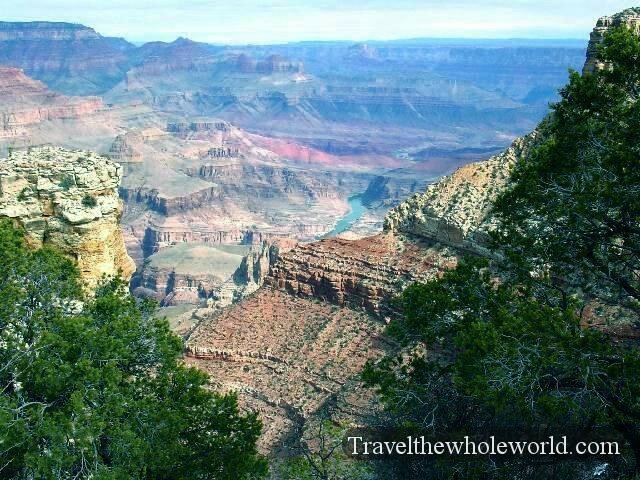 First off, Arizona is home to the Grand Canyons, one of the most impressive sights not even in the United States but the entire world. While the Grand Canyons are the most famous, there are plenty of other incredible sights such as Horseshoe Bend, the Waves, and Monument Valley. 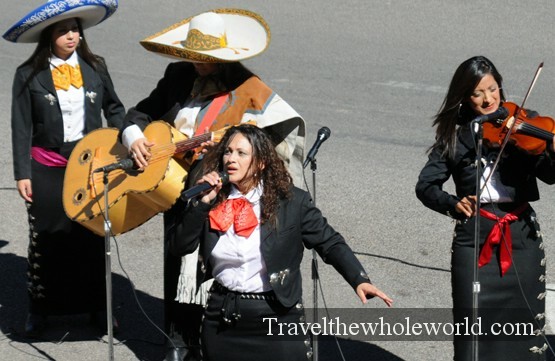 One could easily take over a week visiting all these places, but that still leaves out some of the incredible deserts to the south, ski resorts in the north, and all the unique towns in between such as Sedona or Flagstaff. Lastly the capital of Phoenix is actually the fifth largest city in America, and has lots to offer every kind of traveler. In a state that is famous for deserts and canyons, many are surprised to know that Arizona has some reasonably sized mountains. Humprhey’s Peak is the highest of the state, rising above the San Francisco range to an altitude of 12,637 feet (3,852 meters). Humphrey’s Peak and the surrounding mountains offer excellent hiking and camping in the summer along with cooler temperatures. When winter hits, the peak offers true winter sports, from skiing at the Arizona Snow Bowl or snowshoeing and winter camping. 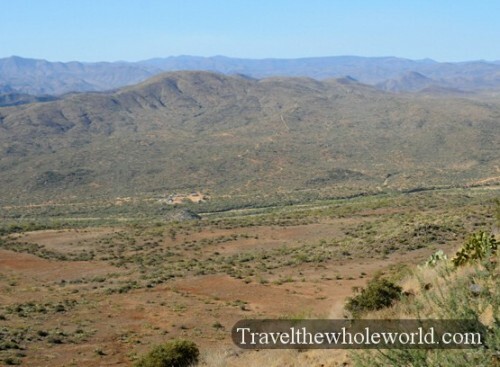 Arizona is one of the driest states in the United States, especially in the center and southern parts. Sometimes day summer temperatures can reach 120 Fahrenheit and see drops as much as 50F the same night. In the harsh environment, small shrubs and cacti have replaced forests. Above are two photos of some cacti from the center of Arizona. 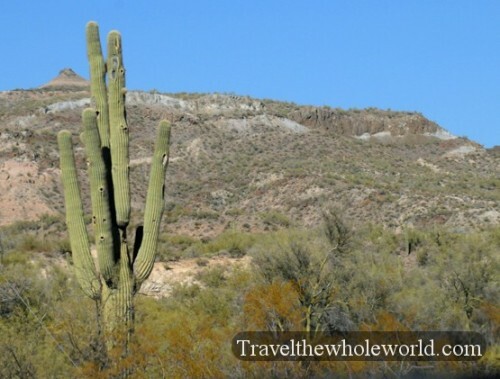 On the right is a large saguaro cactus which sometimes can reach heights close to 15 meters, or over 45 feet. 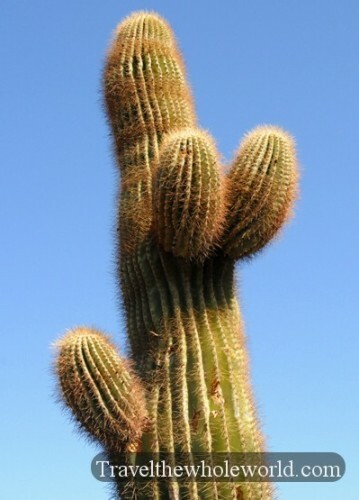 They are very slow growing, taking about 75 years to grow their first arm such as the cactus on the left. 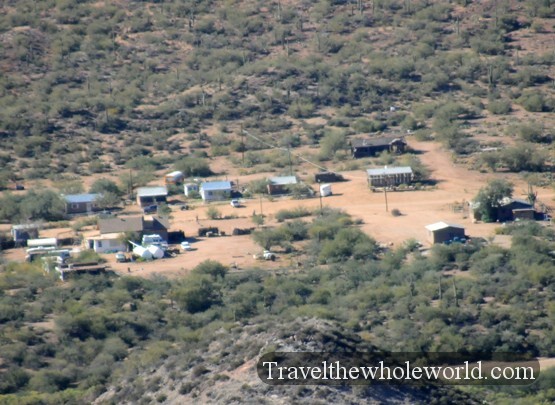 Outside of Phoenix, Arizona is pretty rural for the next 100 miles or so. The photo on the left shows a small town in Arizona. It’s actually in the same photo on the right so you can see it’s in the middle of no where. I’d be depressed living in such a remote place. A popular town known as the gate way to the grand canyons is Flagstaff, located over 2 hours north of Phoenix in higher elevations. The only reason most people visit Flagstaff is because of its proximity to the canyons, but it’s a good place to stop for a day trip. 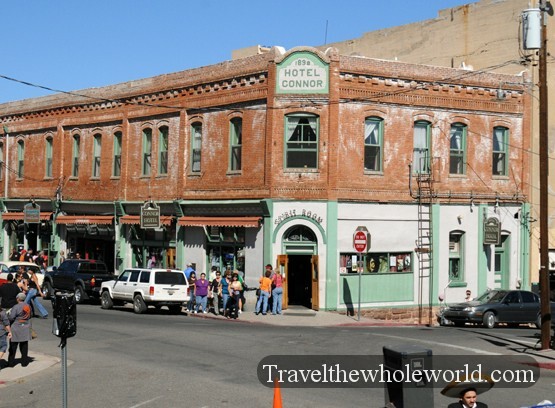 On the left is the hotel Monte Vista, located in the historic downtown area which only dates back to over a century. 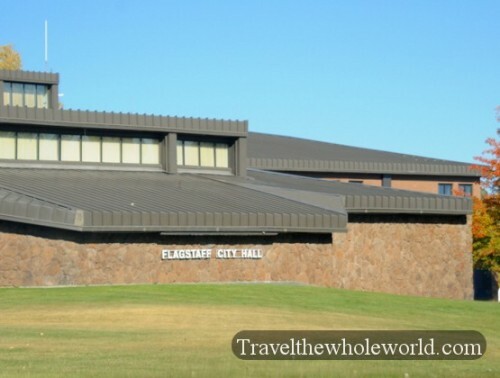 Above is a picture of the Flagstaff’s city hall, perhaps the worst city hall I’ve ever seen. 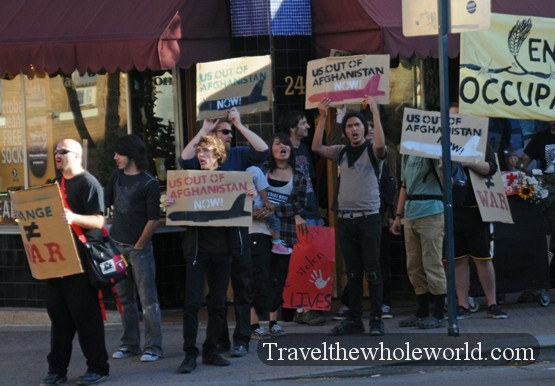 Despite Flagstaff being such a small town, I thought it had a lot of activity going on. The guy on the left is probably the craziest preacher I’ve ever come across in the US. 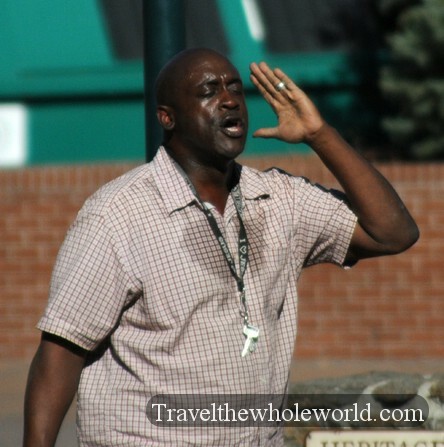 He was shouting and screaming so loud that I heard him from over a block away. 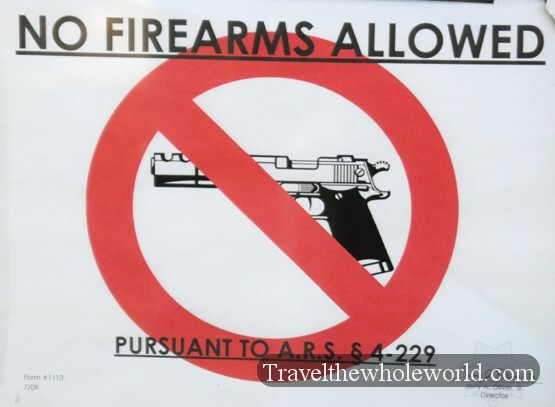 I’ve also seen Arizona as a conservative state, since they are usually pro-republican and the state is famous for its open arms laws where you can carry firearms in public areas. The no firearm sign was put on a restaurant letting customers know not to bring in guns, then only a few blocks away were some extremely liberal protesters complaining about Obama and the US war in Afghanistan. 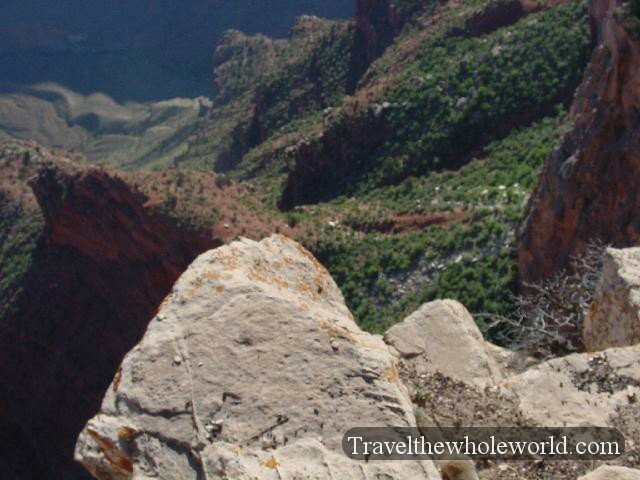 These pictures above are from Arizona’s grand canyons, the second largest canyons in the world. You can see the water flowing through the middle of the left picture. On the right is a view looking straight into the canyon from a cliff. The canyons have lots of outdoor activities including a trail that begins from the rim and descends down into the canyon that usually requires several days of hiking. These two photos were taken in the summer months when the canyons are greener, I have been in the winter time as well when there can be large amounts of snow. These two photos show some more scenery of the grand canyons from the southern rim. The canyons offer some great photo opportunities, and people are free to take risks and hike to dangerous ledges without any railings or fall protection. 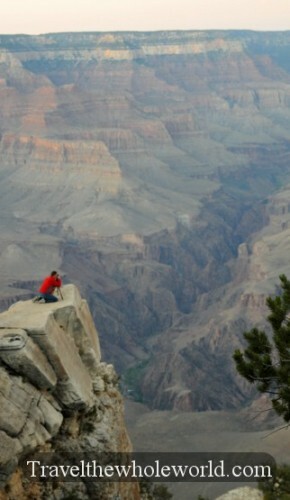 On the left is a photographer taken photos from a cliff, above is another photo of the canyons during the fall time. 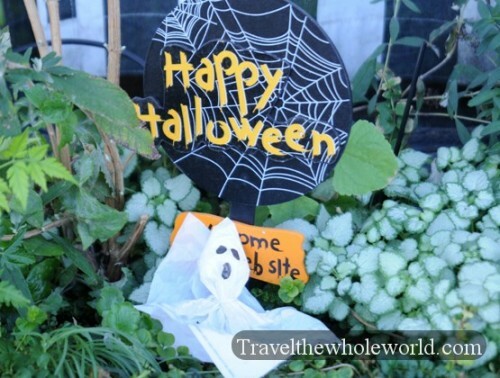 Of course the main reason to visit the grand canyons is for the scenery, but there are plenty of places to enjoy outdoor activities and also lots of wildlife in the area. The first time I drove through the grand canyons I entered the national park at 5am and almost T-boned a herd of elk. These photos above are some horrible shorts of elk on my most recent trip, but you can see how large they are, especially the male on the right. The mouse in the center got a lot of attention from tourists as it came out and snatched a small piece of food that was on the ground. And for those who love shopping and souvenirs, there are plenty of stores in the canyons that sell everything from gems to cacti. The grand canyons aren’t the only canyons in Arizona. 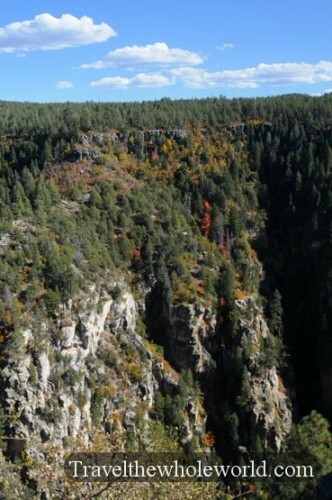 On the left is a photo of another canyon located closer to Flagstaff. 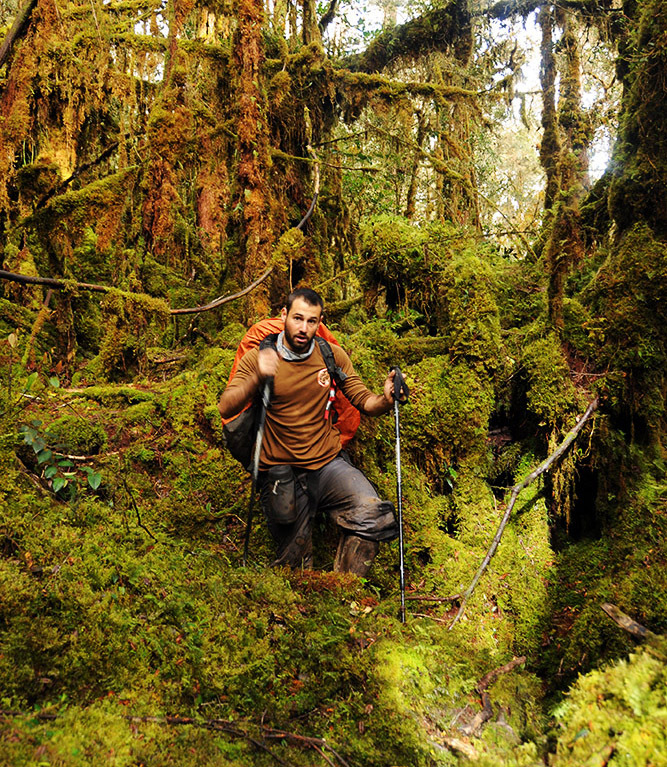 This canyon is covered with pine and occasional deciduous trees that were turning yellow and red in October. Oak creek canyon is located in the region and is Arizona’s second largest canyons. 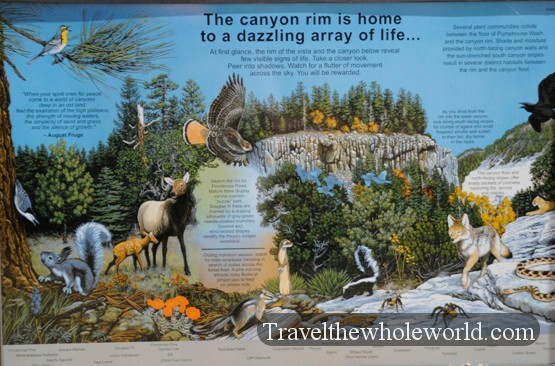 The photo above is of a sign that showed some of the wildlife that is popular in the high altitude forests of Arizona. 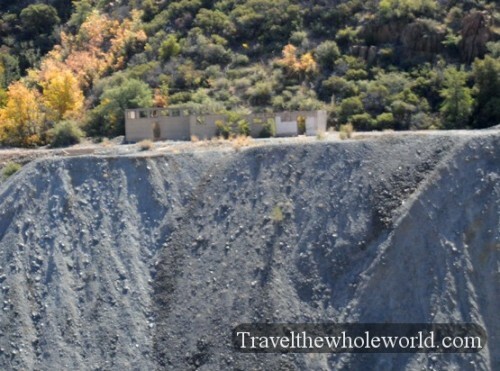 These surrounding photos are the remains of some mines that were created in the late 1800s. This area is known as Cleopatra Hill, and heavy mining began in 1883 that lasted for over 70 years. Everything is in ruins now, but you can still see some of the buildings that were built in the area and the crazy mining car track below that was built way up on the side of a rocky mountain. 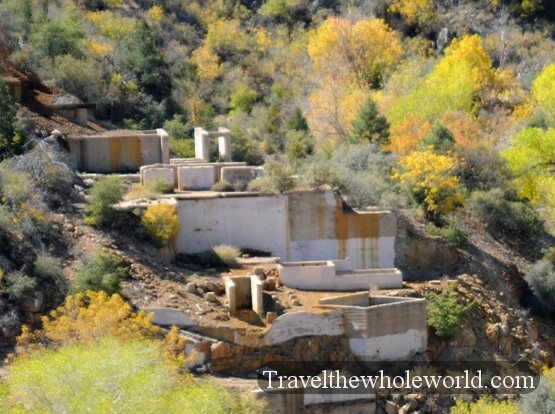 The mining town of Cleopatra Hill was what drew the founding of the small town of Jerome. 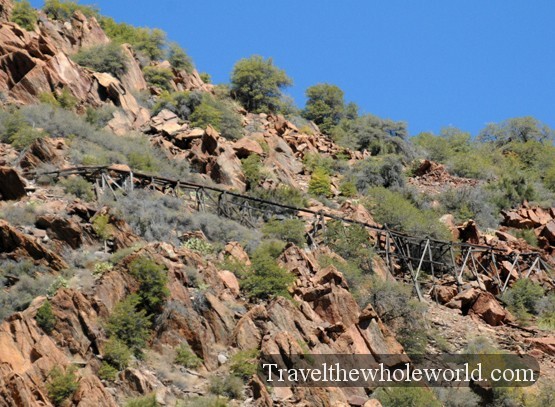 At its peak, Jerome had a population of over 2,500 people until it turned into a ghost time after the mine closed down. At one point, the New York times in the early 1900’s called Jerome the wild west’s ‘most wicked town’ due to the prostitution, gambling and other illegal activities that took place back then. 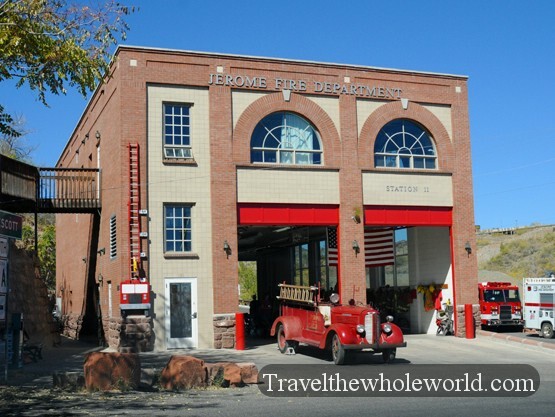 The population of Jerome recovered recently when the town became a tourist spot attracting people with its history and small bars and restaurants. Above is a photo of a hotel and bar in Jerome and their fire station on the right. Below is a crowd enjoying a mariachi band play on a Saturday afternoon. 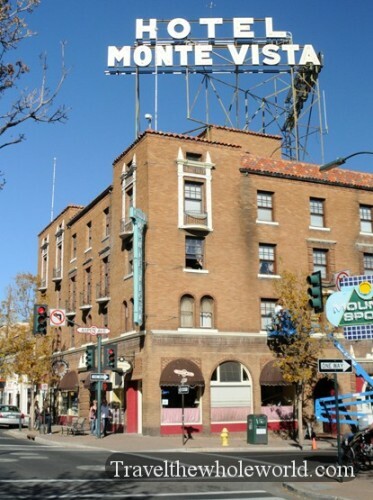 I found it funny that most of the government designated historical buildings in Arizona were just over a hundred years. Since Arizona wasn’t officially a state until 1912 it has little American history. The above photos are of Montezuma castle, and are one of the few ancient structures found in America that were left behind by Native Americans. 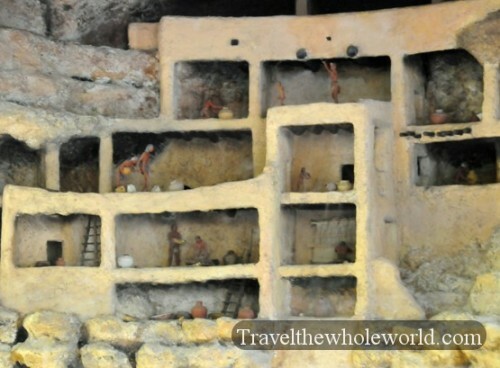 The castle is a well preserved cliff dwelling that were popular with natives in the southwestern region of the US. 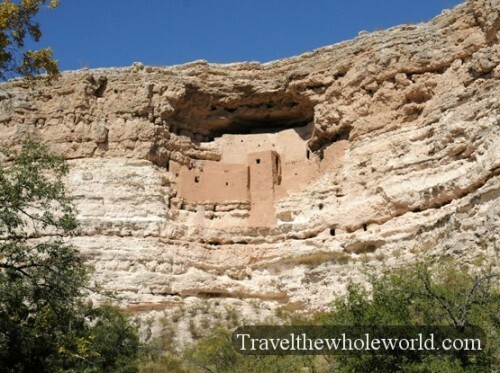 Montezuma castle is over 1,000 years old and even has an ancient irrigation ditch that is still in use today. 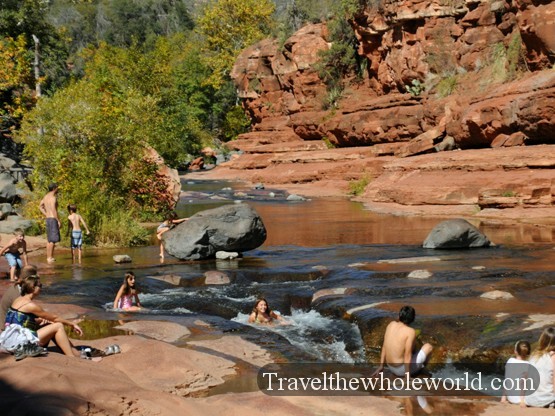 Some last photos of Arizona’s natural beauty are of the Sedona area, also known as red rock and sliding rock. 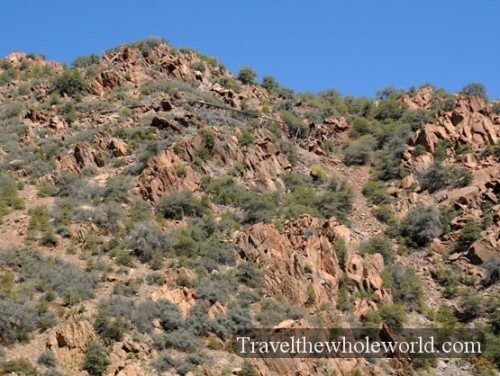 The photo on the upper left shows some of the natural colors found in the rock formations. On the right is another scenery shot with the town in the foreground, and some giant weeping willows on the left side of the photo. 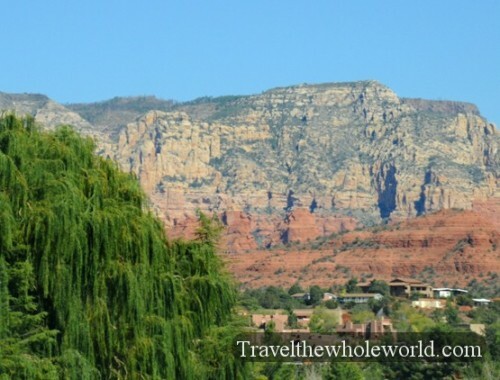 The town of Sedona did a good job of keeping the town green in such a hot desert. 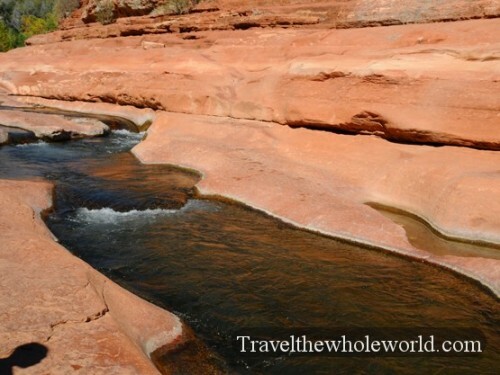 These top two photos are from slide rock part that is found near Sedona as well. 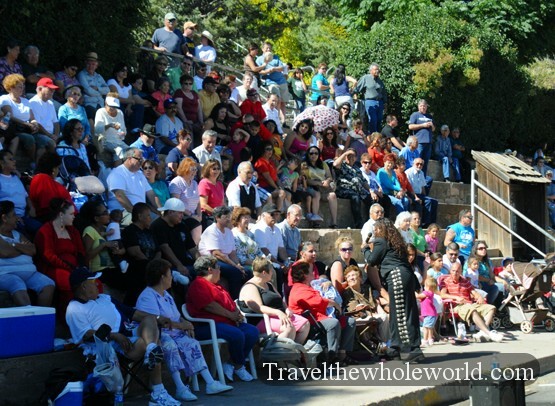 Thousands of years of water flow through the area carved out a natural water slide which people enjoy in the hotter months of the year. The upper left photo shows a few bikers from a larger gang that was passing through Sedona. 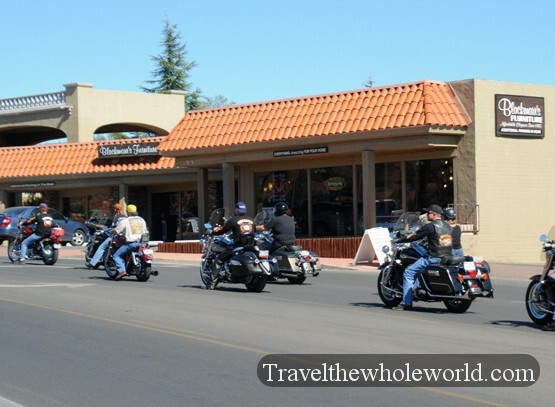 Snowbirds and bikers seem to love Arizona for some reason. In the winter, many people leave the northern cold and spend their time in Arizona until spring and then head back north. I imagine a hundred years ago life was extremely challenging out in the hot desert where a drought could possibly mean the end of your life. 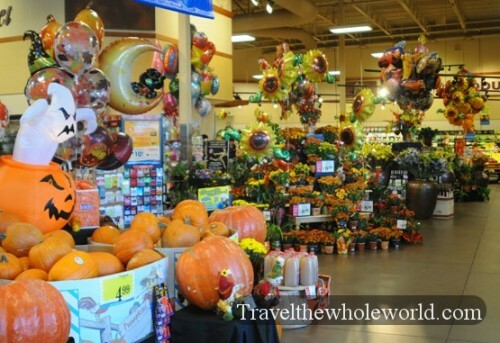 In modern times, with air conditioning, huge grocery stores, and other luxuries Arizona is a great place to live or visit and no longer a death trap. 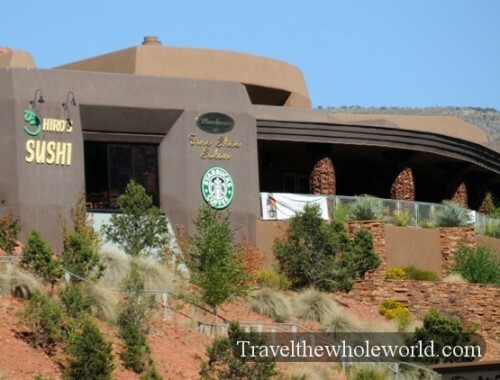 The upper right photo was from the town of Sedona, where you can even find a sushi restaurant in the middle of the desert.